The same company that brought you GERANIUM 20™ – the #1 selling Geranium supplement in Canada, now unleashes SYNEPHRINE 30™. Each serving of SYNEPHRINE 30 is packed with 30 mg of pure, pharmaceutical-grade synephrine, which is the highest concentration legally allowed! Take SYNEPHRINE 30 on its own for rapid fat loss or stack it with your favourite fat burner to amplify the themogenic power! (such as GERANIUM 20™) to maximize fat loss. increasing heart rate or blood pressure. With the release of SYNEPHRINE 30™, the researchers at SD Pharmaceuticals take the guess work out of synephrine supplementation. In every capsule of SYNEPHRINE 30 you get a precise and maximum allowable 30 mg dose of PURE synephrine hydrochloride! You need to use synthetic pharmaceutical-quality synephrine HCl if you want to truly maximize thermogenesis and fat loss! 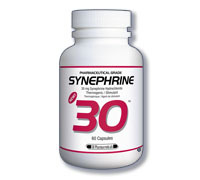 Research shows that 30 mg of synephrine HCl is the ideal dose, and this is exactly what SYNEPHRINE 30 delivers!